Yesterday was the national premiere of the film Finding Traction by Partnership Productions featuring veteran ultrarunner Nikki Kimball. The film showed at Missoula’s historic Wilma Theater as part of the Big Sky Documentary Film Fest, and chronicles the story of Nikki’s fastest known time record on Vermont’s Long Trail, America’s oldest long-distance trail (273 miles in 5 days, 7 hours, 42 minutes). The film was significant on so many levels for me and for women runners in general. The film brings to life the complexity of Nikki’s character. On a personal level Nikki seems friendly, approachable, charismatic, extroverted, and down-to-earth. But a deeper glance into her life reveals a history of deep, dark struggles with depression. Perhaps she is right. During 2013, in the wake of the Western States 100 Mile Endurance Run—my first 100-mile race—I moved to Bozeman, Montana for a summer internship with a physical therapy clinic. Having met Nikki’s good friend Jenny Pierce at Montana’s Le Grizz 50-Mile race, I was able to make contact with their small running group in Bozeman. Nikki had just placed 2nd at Western in the second hottest year in the history of the race. In 2013, the four top women were some of the most experienced women in the field. With an average age of 42, all four—Pam Smith, Nikki, Amy Sproston, and Meghan Arbogast—are former or current members of the USA 100K team. And Nikki, having more top 10 finishes at Western than any other woman in the sport, has won the acclaimed event three times. Two weekends after Western, I found myself chatting with Nikki on the phone: “we’re doing a long run if you want to come.” A long run with Nikki Kimball could mean many things. Upon clarification, she threw out a vague 3-4 hours guesstimation, adding she wasn’t sure who else would be joining in for the run. As a novice trail runner myself, and an infant to the world of ultra racing, a mixture of excitement and fear drove me over to Nikki’s house that day. Upon arrival, a hurricane of excited dogs invited me into Nikki’s house, where North Face gear was scattered in her living room and several dusty bronze Western States cougar trophies stood in a corner amongst a myriad of others. Nothing pretentious exists in Nikki’s world. If anything, these tokens of achievement seemed to just be spilling over haphazardly into her real life as a mom to some happy pups and a friend to some really cool people. With a note of disappointment Nikki announced we were on our own that day. One thing is clear, Nikki cherishes her friends and pets as family. In a strange chain of events, the multitude of friends she normally runs with were all occupied. I found on later runs Nikki could pull together nearly a dozen people and dogs on an impromptu trail running gathering on any given Sunday. As someone who runs alone for 99.9% of my training, I found Nikki’s base of running friends extraordinary. Our run consisted of a 17-mile loop passing by Blackmore mountain into a valley where cairns occasionally marked a trail, and our conversation lasted the entire four hours. In and out of physical therapy discussion and the world of racing, Nikki is surprisingly easy to talk to, like someone you’ve always known but forgot how much you like. On the trail several people stop to chat and catch up with her. She gave me tips on nutrition and training intensity with ease as someone who lives and breathes her sport and coaches people informally on a daily basis. What became immediately apparent about Nikki is that she turns her fierce competitive nature on and off quite naturally and easily. Discussing races from ten years ago, she remembers turn by turn tactics and events that either made or destroyed a race for her. But when asked what her current average training volume is, she has no idea. “I’ve been doing this sport so long…” she explains. It’s all second nature now: the miles, the strategy, the competition. She doesn’t need to track miles, when race day comes she is ready. Nikki Kimball on Vermont’s Long Trail. Photo: Partnership Productions. For nearly seven years Nikki was undefeated in ultra marathon racing. She was the best in the world, and she has no qualms about admitting that fact. If anything, she explains clearly in Finding Traction, that she would like to see more women stepping it up in the sport. She tells me during our run that we as women need to be more confident with our racing. The achievements of women are often backstaged to the world of men’s racing, and Nikki explains even winning the Ultra Trail du Mont Blanc in Chamonix barely got her a newspaper mention the next day. 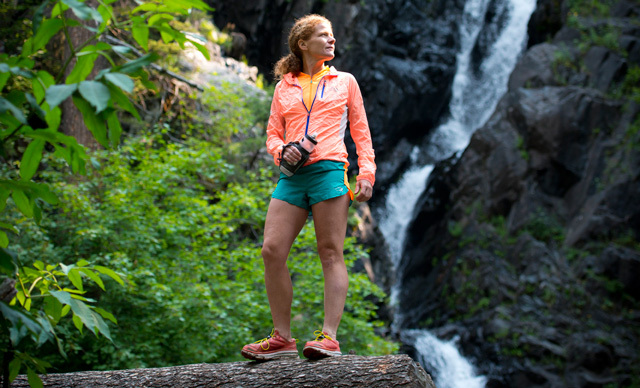 But as someone who has won or taken podium in every major ultrarunning event on the planet, she is acutely aware of the performance potential of women. She wants women to push the boundaries, much like she has her whole life. But how far are we willing to go? Finding Traction shows that Nikki goes deeper into the pain cave than most of us are capable. As her good friend Jenny Pierce gently consoles her, Nikki hobbles in pain down the trail at night, sobbing. The scene brings tears to my eyes. Jenny explains it was one of the hardest things she’s done: encouraging her friend to continue through her agony. Nikki admonishes that we must have faith in the ups—just as certain as the downs—they come eventually. The suffering is absolutely worth “the moments of bliss.” Her history of enduring pain is long: through biomechanical problems that made it hard to walk as a child, to years of debilitating depression, to the most difficult races in the world. Nikki is seasoned to misery. But as sure as it comes, it goes and the next morning she is laughing and joking with her wary crew. Through it all she is comforted and driven by her passion to help others. Her project on the Long Trail raised money for the non-profit organization Girls on the Run which helps young girls gain appreciation for physical activity. The film will show again in Missoula on Saturday February 14th, 2015 at 2:30PM at the Top Hat. Tickets can be purchased online or at the door for $8.